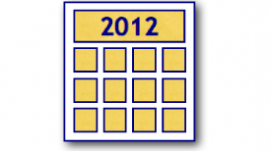 The MUG Event Calendar downshifts as we head into two holiday weeks and the end of 2012. Bryce Button of AJA will present their waters to a Final Cut group in Colorado, and holiday parties will be held in New York, Connecticut and beyond. Other topics set for this week include iPad speech, iPad reading, and the Dashboard and Widgets.